Over the last few years, more and more of my students struggle to stay focused for more than a few minutes and lack interest in the things I liked as a kid. It’s a daunting reality for an experienced teacher. After all, you’ve put the time in and you think you’ve got everything covered. But it’s NOT true! Every new school year brings a new set of students and possibilities. It takes a lot of effort, time and creativity to keep up with the new kids and their needs year after year. That’s why this blog post is loaded with awesome, easy and free creative movement activities. And who has the TIME? After all, creating new lessons and materials every year for every grade level is near IMPOSSIBLE! But you don’t have to! The good news is that this blog post is going to give you one easy and free solution to keeping your students engaged. Yes! Creative movement is the ONE thing you can do to keep your students engaged and learning. Movement is a natural way for children to respond to music. Movement is how many children learn. Movement makes aural sound more real. Movement is supported by the National Standards. Analyze: Analyze how the content of varied musical works inform the response. Enduring Understanding: Response to music is informed by analyzing content (social, cultural, and historical) and how creators and performers manipulate the elements of music. Essential Question: How does understanding the structure and context of music inform a response? Connect #11: Relate musical ideas and works with varied context to deepen understanding. Enduring Understanding: Understanding connections to varied contexts and daily life enhances musicians’ creating, performing and responding. Essential Question: How do other arts, disciplines, contexts, and daily life inform creating, performing and responding to music? 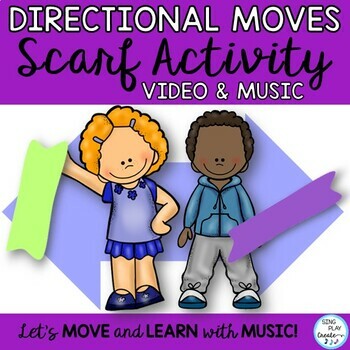 Once you understand how you can use creative movement in your classroom, you can use the ideas and activities in the freebie from this blog post, over and over again in a million different ways to support all of the standards that you’ll be teaching for every grade level throughout the year. Maybe you’re frustrated or don’t know how to implement creative movement, or even know why students need creative movement. You’re NOT alone! It’s easy to put on a Youtube playlist and let the kids go crazy! (Although that is FUN! ), or teach a folk dance or body percussion. But it’s harder to use creative movement as a concentrated strategy to help students learn concepts, burn energy and connect emotions. Orff, Kodaly, Eurythmics and Dalcroze methodologies teach creative movement applications. Here’s some ideas based on what I’ve garnered from studying them and also from my personal experiences teaching in the classroom. (Disclaimer) This is my way of breaking things down, i.e. simplifying-. Just so you know, there’s a lot more research, resources and creative ideas out there. But I’m sharing the ideas that I think will help ANY teacher integrate creative movement in their lessons and support the music standards. CONNECT TO A LEARNING GOAL- Where movement supports aiding learning and/or learning the standard in the lesson. CONNECT TO A NEED- Where movement provides a brain break, or is being presented as a standalone activity that may have a separate learning goal but is not the same as the lesson. CONNECT THROUGH EXPRESSION- Where movement is free and supports a broader idea in the lesson. Now, the one solution is integrating creative movement into your lesson plans so that you can keep your students engaged. When you get intentional about creative movement, you’ll find out that your students are actually learning faster and learning more! After all, we take our lesson planning seriously- right? So why not get the most out of the time you’ve already invested in your lessons? Here are some ideas on how to integrate creative movement into your lessons. To make it a little easier for you, here is a FREE CREATIVE MOVEMENT PLANNER with worksheets that show how to integrate creative movement into your lessons and specific ideas for activities. CLICK HERE to get the FREE CREATIVE MOVEMENT PLANNER NOW! You’ll find a chart with the three strategies explained in greater details with a CHEAT SHEET of different activities that can used for each category. You’ll also find a chart for you to plan your activities as you connect them to your current lesson plans. And, you’ll find some charts to put in your planner so you can keep a record of the ideas you’ll be using. After you go through the worksheets (which are easy to fill out since I’ve included so many ideas), You’ll have some new tools to use in your classroom to be a more effective teacher. 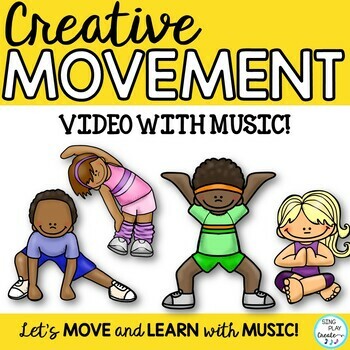 To get the most of this blog post, and really understand how to implement creative movement into your classroom, you’ll want to download the free sheets and put them to use right away. There are many songs and games in different music curriculums that support creative movement, but the dances and activities don’t always support a learning goal. If you’re trying to increase learning, you may want to implement creative movement activities that support the learning goals. No one should feel guilty doing Freeze Dance activities- but choosing the types of moves, so that the movement connects to a broader learning goal will give the students that much needed “break” and help them learn concepts faster. What kind of creative movement activity would you use to activate Right and Left hands for students learning recorder, ukulele, guitar, and Orff instruments? That’s why you need to CLICK HERE to get the FREE CREATIVE MOVEMENT PLANNER NOW! Creative movement can be used for many reasons. It can be used to give students a needed break, a reward, or outlet. It’s a really good transition activity too. My music classes often begin with a movement activity to help students acclimate to the music room. It’s TRUE! Creative movement activities are perfect for this reason because giving the students a five to ten minute break will get the brain connections going and have them ready to learn again. Read about 5 Ways to Use Bean Bags in Your Classroom HERE. Creative movement activities that connect to a theme help students internalize through experience and provide opportunities for them to be creative. 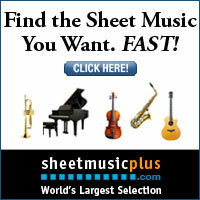 It gives students an opportunity to become more musical and a chance for the teacher to know if the students “get it”. Beginning lessons with selections of music, literature (picture books or poetry), artwork and pictures, is the perfect way to get the creative juices flowing and inspire creative movement. Which lessons do you implement expression as your creative movement activity? A student favorite is “Carnival of the Animals” creative movement activities. Students receive a scarf to use to “show” how the animal in the music moves. 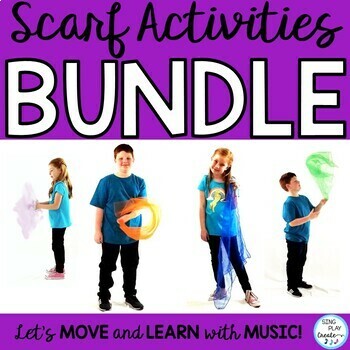 You can color group the students with the scarf colors and give smaller groups of students the opportunity to express music through movement. Now, the whole idea of using creative movement may still seem overwhelming, but I know that if you begin incorporating different types of creative movement activities into your lessons each week, it will get easier. My tip is that selectively choose which concepts and lessons you want to start incorporating creative movement. Implement activities one unit or one grade level at a time until you feel confident about the methodology. Then you can apply that learning to more lessons and more grades. This way you’ll gain confidence as you change and grow your mindset. Just think! Your students will be excited about the new movement activities and you’ll be pleasantly surprised at how they are learning and loving your classroom. If you haven’t grabbed this FREE planner yet–CLICK HERE to get the FREE CREATIVE MOVEMENT PLANNER NOW! Halloween Music Class Tricks or Treats?